These large equids are long-lived, hardy, and perfectly adapted to succeed in Africa’s sometimes harsh environment. They are also an important link in the food chain and a favourite prey species of the lion. Of the two Namibian species, Hartmann’s Zebra is the larger. This type of zebra is similar in appearance to the Cape Mountain zebra. The Hartmann’s Zebra is just as well adapted for mountainside manoeuvring, with strong, fast-growing hooves to make up for the extra wear. You can see these hardy animals among the rocky plains of Etosha National Park and the Namib Naukluft Park. One of Africa’s most prolific plains animals, Burchell’s Zebra are distinguished by the feint brown lines present alongside their characteristic black stripes. You can see them in most of Namibia’s nature reserves, wherever there is suitable grazing. Burchell’s zebra are also known as plains zebra, due to their preference for open grasslands and you can see them on a day trip from your Windhoek accommodation to Gocheganas Nature Reserve, 29kms away. While the dramatic shades of the zebra’s black and white coat pattern may not seem a good idea among the tawny shades of the bush, this striking livery works best when it really counts. Take a look at a herd of zebra in the half-light of dawn or dusk, the time when predators are most active, and you will notice that it is difficult to pick out one animal from the grey haze of the herd. Studies reveal that the alternating colours of the zebra’s coat may also deter disease-carrying tsetse fly, which has been proven to avoid settling on two-tone surfaces. Burchell’s zebra are common all over the country, but it if you are looking to see both kinds, along with a wide range of other African animals – head for Etosha National Park. Both species of Namibia’s zebras thrive in this seasonally arid wilderness. Hartmann’s zebra frequent the rocky terrain of Western Etosha in the region of Dolomite camp and are often seen on self-drive safaris here. Wherever there is grass and water, you will find Burchell’s zebra in Etosha, often in the company of other plains species such as wildebeest. You can be certain that where there are zebra, there are lions in the vicinity too, especially around the waterholes. Recent observations have revealed that Namibia’s wild zebras are in fact the world record holders when it comes to annual migrations. While the Serengeti remains the largest and most dramatic migration on earth and covers a longer, more meandering route; Namibia’s zebras, in fact, cover more distance than the Serengeti herds from end point to end point in their 500km trek across Namibia and Botswana. 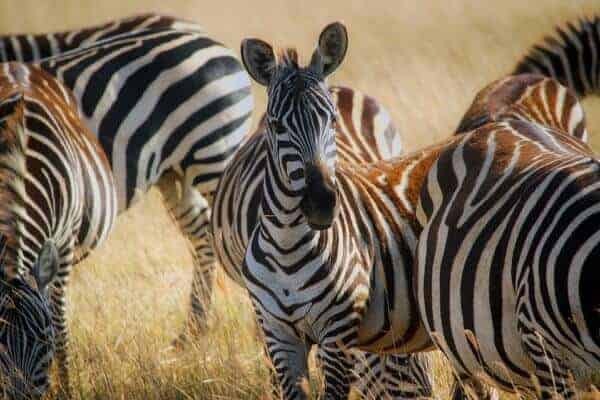 Although there may come a time when you tire of watching the vast herds of these placid horsey animals during your safari, you can rest assured that wherever there are zebra things are right with the world. The presence of large herds is a sure sign of a thriving savannah. Visit Etosha National Park to find the herds on your next trip to Namibia.